Waking up to freshly fallen snow can be a peaceful, idyllic scene, but realizing just moments later that you have to drive in all that white fluffy stuff to get to work can take the serenity out of the moment. While it’s important to keep up with car maintenance all year, our colleagues at Consumer Reports point out it’s more critical in the winter months when travel can be hazardous and when waiting for help in the cold can be unpleasant. Consumer Reports put together several helpful tips to ensure that your travel plans aren’t hampered by unexpected car troubles this winter. • Make Sure Your Tank Is Full…: Maintaining a full — or nearly full — tank of gas not only helps to ensure you’re able to wait out a cold traffic jam or being stuck in the snow, it also helps reduce the moisture that can condense in the tank. • … and your tires: CR notes that winter driving safety is mostly impacted by traction, and tires play a large part in that. Drivers should make sure the pressure in their tires is adequate, by checking the pressure monthly and topping it off when necessary. 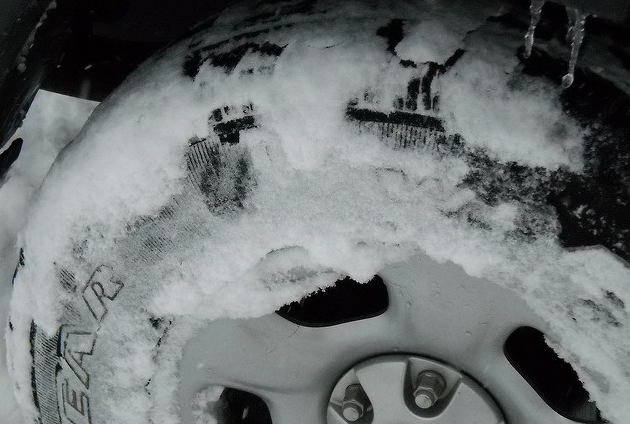 Additionally, motorists should check their tire tread, as it should be at least 1/8 an inch. • Four- or all-wheel-drive is great, but not perfect: While four- and all-wheel-drive can certainly come in handy while traversing through snow-covered streets, they only provide extra traction when accelerating. That means they don’t offer much help when braking or cornering. • Accelerate slowly: When jumping in the car to take off, remember that slow and steady wins the race, or at least gets going safely without wheel spin. • Avoid passing snow plows: Snow plows have a job to do: clear the street for motorists like you. Often that job puts them on the roads when weather isn’t ideal, so passing plows during this time can be even more dangerous for other drivers. CR points out that passing a plow requires a car to accelerate, which can increase your risk of sliding on already slick roads. For more winter driving safety tips visit Consumer Reports.